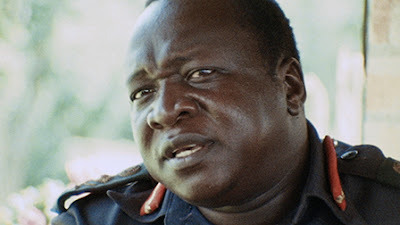 How the heck did director Barbet Schroeder score direct access to Idi Amin, the controversial military dictator of Uganda? He simply asked. 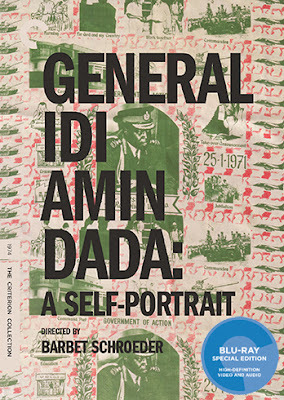 The title star of “General Idi Amin Dada: A Self-Portrait” (1974) may have been mocked by the Western intelligentsia as an ignoramus and a buffoon, but he understood the importance of the media and, especially, the importance of being on camera as much as possible. The self-made general and self-styled savior spewed absurd lies while also claiming to be universally loved because he was the only man who told the truth, and to be feared throughout the world for his unparalleled savvy and might. It never mattered how ludicrous his empty posturing was, only that people were constantly watching and listening. Of course he said yes to the Frenchman who wanted to make him a movie star. I know what you're thinking, dear 2017 reader. If you are tempted to draw a seemingly obvious comparison to a current world leader, however, please note that in his not-brief-enough tenure, Amin allegedly murdered a few hundred thousand of his fellow citizens, and jailed many more of his real and imagined political foes, so let's respect the horror suffered by a generation of Ugandans and move on. Amin struts and preens his way through a series of pathetic military exercises, including one in which his crack paratroopers prepare for battle by leaping off a two-inch-high porch step, and equally pathetic cabinet meetings where he promises he wants nothing but openness and honesty, and pauses for neither. The question isn't so much whether Amin believes his preposterous rhetoric, but whether he thinks anyone else will believe it, at least anyone not living under immediate threat of his force. Schroeder notes that Amin was such a natural on camera that he only needed about eight hours of total footage during his two-week shot to accumulate enough material for a feature-length cut. The general is undeniably magnetic and all the more terrifying for his carefully rehearsed sense of calm. He does not yell or directly threaten anyone, but his over-the-top laughter, feigned interest in conversations that are really monologues, and his icy stare speak volumes. The documentary opened to widespread acclaim in 1974, and multiple descriptions of the film as the funniest comedy of the year provide evidence that irony-drenched hipsters are not exclusively a twenty-first century creation. Certainly, the film offers its share of absurdist humor (“Dada”), such as Amin cheating in a swimming race by barreling over an opponent who quite obviously had no intention of daring to challenge the great general, but it is also a chilling record of a genuine monster, a sociopath too irresistibly and disturbingly entertaining to be easily forgotten. The film is presented in its original 1.37:1 aspect ratio. I can't imagine too many people were clamoring for a high-def upgrade of this documentary, but the “new 2K digital transfer” certainly looks sharper than the old 2002 SD Criterion release, and features more subdued color tones. The linear PCM mono track is crisp and efficient. There's not much to say about a film consisting mostly of interviews save that there are no audio problems that would distract the viewer. Optional English subtitles support the audio. The 2002 Criterion DVD was scant on extra features, and this 2017 Blu-ray upgrade only adds a few small ones. We get the old 2001 interview with Barbet Schroeder (26 min.) and a new 2017 interview (12 min.) with the director which covers a good deal of the same ground. But, oh, that story of how Amin “suggested” certain film cuts to Schroeder can't be told enough. The only other extra is a 2017 interview with author Andrew Rice (16 min.) who discusses Amin's reign from seizing power to his self-imposed exile (he ran like a coward). The slim fold-out insert booklet includes an essay by film critic J. Hoberman. Go ahead, laugh at the movie. It's funny. But reflect on Amin's long, dead-eyed stare that wraps up the film before you go calling it a rip-roaring comedy. In any case, it's a great and essential documentary.